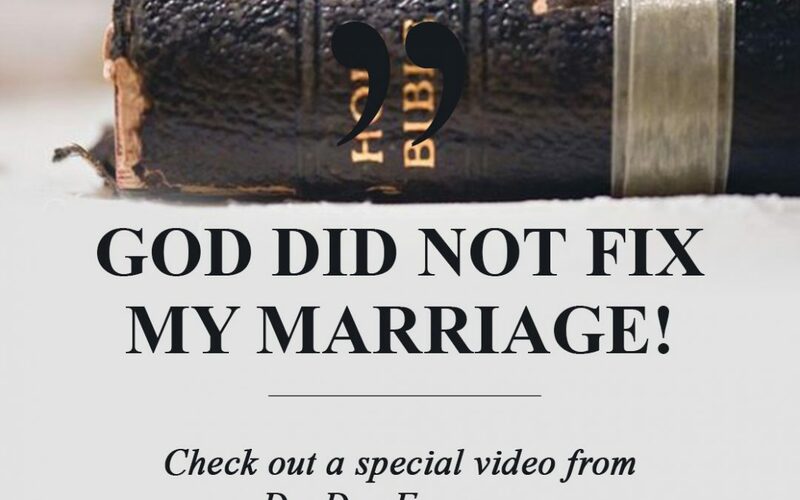 God Didn’t Fix My Marriage! Love you message, you are such a blessing to me. I thank God for you. Good Morning Dr. Dee Dee. You’ve touched on a subject that has been on my heart for some time. My husband and I have been married for 21 years. For a long time, I thought that God just needed to fix my husband so that we could have the marriage I wanted. It wasn’t until later that I discovered that I needed God to work on ME so that I could be the wife I was called to be. Thanks so much for your love, your wisdom and your ability to share with us by making it plain, letting us know that all things are possible through Christ, especially having a God-favored, Godly-blessed marriage/covenant. Love you much Dr. Dee Dee!! Absolutely wonderful! Nice tone for the day, I felt your heart Your love. Thanks for the daily inspiration. I Love You My Sister In Christ , Such A Sweet Inspiration !!!! You’re Trully A Treasure Here On Earth For People. Thank you Dr. DeeDee for your wonderful words of encouragement. It’s always right on time! Thank you so much. I am sooo appreciative of the positive image of marriage that I get from you guys. Most of us don’t get to see that. At this time my marriage is so far in the dumps, but I am still in faith that God will restore my marriage. I the mean time I will be working on me. Thank You for being awesome role model and an awesome woman of God. Awesome!! I love the video blog. I don’t always get the opportunity to read them fully. It is wonderful having the video or even audio option. Thank you, truly a blessing!! OMG, this really blessed me today ,just to see you in person. It’s how you took the time to do this . I’m sure so many are blessed by this . I get so excited every time I see you and Dr. Mike in the marriage sessions on tv and I’m a 73 year old widow. Keep doing what you are doing .when I get an opportunity I want to visit Spirt of Faith again. Please sy a prayer for my son Dallas. May God continue to Bless your ministry in Jesus name! Thank you. Encouraging word for a bride to be. I’m getting married for the first time in my 60’s. I look forward to your blogs and teachiing. It’s like a girl friend talk. Blessings! Thank you, Dr. DeeDee! The message is on point! Yes thank you.. Great word! I love it. Thanks for encouraging and thanks for being so transparent and sharing. You are truly a blessing to the kingdom. That message blessed my life. Thank you Dr. Dee Dee for taking time to speak to us and for sharing your heart. I so love you! My husband (Shaun) and I CELEBRATE💃🏿💃🏿💃🏿you both. PS.We have 31 years also July 20. Loved your post this morning. I could write a book about marriage. Glad to be single again. Married too young and now regretting that decision after having lost two houses and half of my retirement. Women protect yourselves if you are getting divorced after being married for over twenty years. Pray and protect yourselves. Praying no woman will face what I endured after having a stroke from all the stress of a broken relationship, loss of houses, car, job, and health.I consider myself still young at 53 and I am still here with a praise. God is awesome. Lifting weights, eating right, and getting better, AND planning to buy another house next year. God will do it again and again! God is awesome! And so true to His WORD. I thank God for putting the right people in my life at the right time. This message could not come at a better time. Continue to be humble and share your Faith. May God continue to Bless you and your family today, tomorrow and forever. Good morning, Dr. DeeDee, I needed this my husband and I was separated for about a month and half for the second time…but I decided to walk what I’ve studying and reading. I thank God for confirming for my decision. You’re amazing Dr. DeeDee. I’m divorced, and a renewed virgin. 😀 I’m looking to God and working on me daily to be s better me. Thank you for the encouragement this morning, it was a blessing to not only hear your voice, but to see that beautiful smile today. Thank you for taking the time to sow richly into us. May God continue to richly bless yours and Pastor Mikes marriage. Thank you for your prayers, I pray for both you Pastor Mike, and your ministry. I love you both. Wow great motivation and encouragement, Dr. Deedee you are a real inspiration to me. Thank you! Thank you Dr. Dee Dee for taking time out to make this beautiful video! I love and appreciate you and all that you do more than words could ever express. You are truly a phenomenal woman of whom I am humbly honored to have in my life. Rejoice and enjoy this beautiful day the Lord has made!! Thanks Dr. Dee Dee for those words. This also applies to every area of our lives! I’m using it!! Beautiful and inspiring message for all that are married and those who desire to be married one day! Thanks for being a blessing Dr. Dee Dee! I just love your spirit! I ask God to continue to bless you and your family. I love video blog! Thanks for sharing. Another good one Dr.DerDee and here I was waiting on God but you are absolutely right. In listening to guys all these years along with Apostle Price & Dr. Betty I should have known. Thanks for sharing always. See you soon I hope! Thank you for your words of instruction on fix my marriage. Even though I have been married for forty seven years there are things that I change in me to make it better! You have a birthday coming up on June 15 so HAPPY BIRTHDAY!!!!!! God bless you Dr. Dee Dee! I have not been blessed with a husband but wanted to let you know that I appreciate you because you have been a blessing to me. Thank u! Thank you Dr. Dee Dee, happy 31st Anniversary and may you and your husband have many more. Blessings to you both. Thank you Dr. DeeDee awesone message and so much needed in this time. I’ve been married 24 years and as you the first 9 to 10 were truly hell on earth, but thank God for His word as a manual for marriage and thank God for you and Pastor Mike, been following you both since moving to Virginia. May God continue to bless and prosper your marriage. Dr. DeeDee I Thank God for you and Pastor Mike daily, Please know that we woman in the body of Christ cherish all that you bring to the body. My example of the Proverbs 31 woman right here in the earth-in the 21st century. Thank you Lord, we love the Freeman’s!!!! Thank You So Much!! Dr. DeeDee You’re Truly A Blessing & Inspiration! Great Role Model! Very Well Said! Every time I see you and Pastor Mike, I tear up because what you have is so awesome. I know you hear all the time how inspiring your marriage has been but the Hell you went through for the first 7-8 years you need to hear it all the time “I Think”. I am in the process of getting a divorce, my husband filed and as I listened to your video I asked myself a question in reference to fixing me what can I do now that will help save my marriage. I don’t have all the answers but I am willing to do the work. Pray for us, please keep us in your prayers. I believe that my marriage has a divine purpose and a divorce would interfere with the plan of God. His mother is a big supporter of the divorce and he has left home in moved with his parents. Thank you for your words of encouragement, your blog and your prayers! I am standing in faith. Nothing like bragging on God to the World! Your marriage testimony is a blessing and a guide to the saved and unsaved. I Thank God for the road map. I enjoyed your message. I am not married yet but thank you for providing the tools to utilize in the near future. I am looking forward to the next empowering message. God bless! Awesome words of wisdom! Thank you! I am going to fix me. Thank any and I love the video. Excellent words of encouragement, I receive, believe and will continue to apply these words of wisdom. Praise the Lord! Confirming what the Lord spoke through me on a women’s devotional for married women last night. Work on you, your relationship with the Lord! We have to do our parts as wives, we have to know our spiritual position in marriage and live it out. Inspite of what our husbands are doing and not doing. We obtain the favor and grace of God as wives. Allow the Lord to work a work in us as wives and in due time you shall reap what you sow. Praise God! So on point! I receive every word you spoke in that video. I have been married for 36 years and I know exactly what you are talking about. I told God that I was going to divorce my husband and God spoke back and said no, you are going to “divorce his ways”, that was profound and only I can understand that. From that point, I have seen our marriage go to another level, it is all good and must seek God and wait to hear his voice. Thanks again Dr. Dee Dee for your awesome testimony and caring for your Sisters in Christ Jesus! Thank you! Working on being a better me daily. We focus on other things and people because we don’t want to look at ourselves. The only person I can change is me. Always blessed by the blogs! God Bless you Dr. DeeDee! I could hear your heart in your message today. I pray that young women take heed to your words. By the way, saw you and Dr. freeman on Daystar last night. Looked Great! I was sooo proud! This message has given me the strength to take a deep breath and finish the race! Thank you woman of God. I love to here your encouraging words. Wow my marriage for the first 7 maybe 8 was Whew!!!! OMG!!! It will be 17 years this July. Thank you so much for your obedience! This was so on time! Love you to life! This personalized message made my day. Thank you!! Today my husband and I have been married for 24 yrs. That was really good insight. Thanks Dr. DeeDee! Love it!! You are such a blessing!! Hugs and love! Dr. Dee dee thank you so much for your love, faithfulness, and just allowing God to use you. Blessings, love, and big hugs to you. That’s so awesome! Congratulations on your anniversary, I hope you both are enjoying celebrating. I so look forward to your posts each week. Thank you for your realness and encouragement! God bless you! I’ve looked in the mirror so many times, and asked myself is it me. Year after year after year, and nothing changes. I cook, I fulfill his needs sexually, I walk in the first lady role with love, integrity, and dignity, and it’s never enough, I’m still on the level he thinks he is on. His closet filthy, trashy, stinky and nasty day after day. But on Sunday mornings he so perfect to the congregation. Pastor, pastor, pastor… All they see and know is that he can preach. No one knows the nasty, selfish, evil, man he really is. The man that acts like he supports me but won’t say a positive word about my accomplishments, say I should do this and that in church but only what he wants me to do so it makes him look good. Your right God not gonna come down and fix a marriage. I can’t fix it or him. I hate him. I’m sick of him. I cannot be help meet to him, my words problematic for him, the truth makes him angry, reality stresses him out. Fix me – I’m a kept, blessed woman, but I’m gotten to the point that I earnestly believe the only thing that’s gonna fix this mess, is divorce. If not I’m gonna be in the street with another man so I can exhale. I really Enjoyed your words of Encouragement!!! Awesome!! I absolutely love this Pastor DeeDee!!! Hi Dr. Dee Dee. Thank you so much for sharing your testimony. I am not married YET! However, your words are providing me with nuggets which I can apply once that time comes. I truly appreciate your wisdom. Hi I’m a new subscriber, Thank God for your life and the sharing of the word He put in you. I watch you guys on living by faith.